Thank you very much to you and your family for meeting me last Thursday. As we discussed, Council recently purchased a 6000m2 inner city block of land, using part of the money allocated for green space as part of the sale of Nelson Park. The majority of this site (4000m2) is dedicated to inner city park, with children’s playground, trees, park benches and open grass areas. The remaining area (2000m2) is allocated as an outdoor recreation/skate park. I left you plans of the proposed park for your information and reference. The purpose of the meeting was to discuss the possibility of naming this park ‘William Nelson Park’, to commemorate your grandfather, and acknowledge his significant contribution to the District. 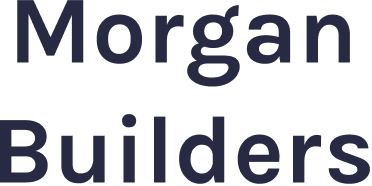 The permission and blessing of your family on the acceptability of this tribute is necessary before moving to the next stage of seeking formal Council approval. Following our discussion, your family considered that this park would be a fitting tribute, given its CBD location, and close proximity to the former Nelson Park. It is a park of significant size, and will most certainly be the largest inner city park purchased and developed by Council using the funds from the sale of Nelson Park. Of importance to your family was that this park be maintained to the highest standard, and that it have adequate facilities, with substantial trees and landscaping. In response, l can assure you that it will have a maintenance regime to the standard of other premier parks, such as Cornwall Park, and will be monitored by CCTV and the Police to ensure that anti-social behaviour and vandalism is minimised as much as possible. There is currently only one toilet block proposed, which at this stage is considered adequate, when we compare it to comparable sized parks in the District. We also discussed that we would include an information board, to tell the story of William Nelson and his family, so that everyone enjoying the park can understand the meaning of its name. I will put together some words, and have these approved by your family before the sign is made and installed. There will also be two name signs on the site saying ‘William Nelson Park’ – one on the main St Aubyn Street/King Street corner, and the other on the Avenue Road/King Street corner. 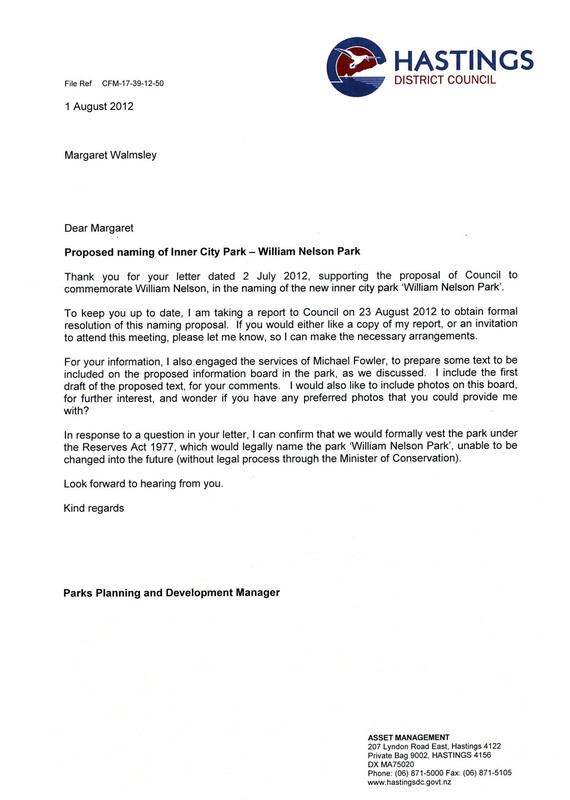 Thank you for your letter dated 2 July 2012, supporting the proposal of Council to commemorate William Nelson, in the naming of the new inner city park ‘William Nelson Park’. To keep you up to date, I am taking a report to Council on 23 August 2012 to obtain formal resolution of this naming proposal. If you would either like a copy of my report, or an invitation to attend this meeting, please let me know, so I can make the necessary arrangements. For your information, I also engaged the services of Michael Fowler, to prepare some text to be included on the proposed information board in the park, as we discussed. I include the first draft of the proposed text, for your comments. I would also like to include photos on this board, for further interest, and wonder if you have any preferred photos that you could provide me with? 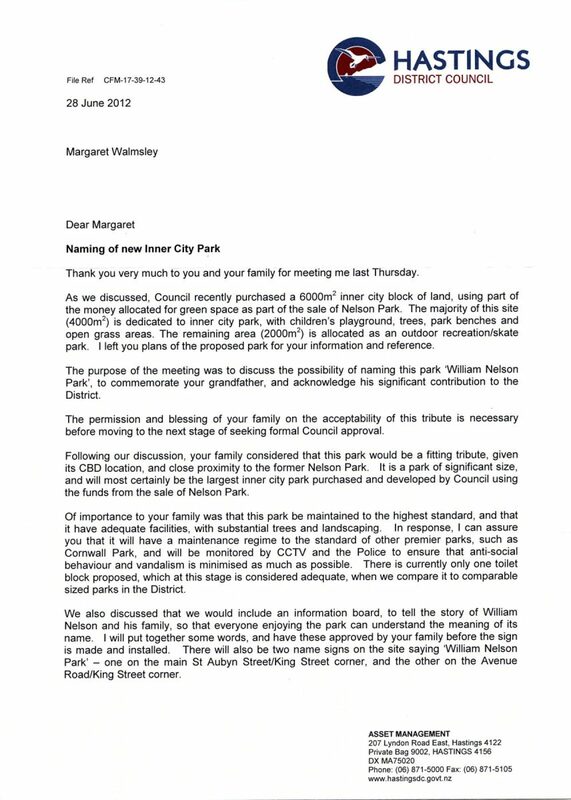 In response to a question in your letter, I can confirm that we would formally vest the park under the Reserves Act 1977, which would legally name the park ‘William Nelson Park’, unable to be changed into the future (without legal process through the Minister of Conservation). As I said in our phone conversation, I am not happy about the proposed wording for the William Nelson plaque. I, and those whom I have consulted with, feel that it is not about William Nelson at all. It says nothing of who he was and much more about the council. I hope you approve of my alternative wording as we, as a family, feel this says what we want and is more appropriate. I know that I mentioned to you about the brothers as a possible reason for some charge for the land but we actually Don’t Know and it would be wrong to set this in writing. 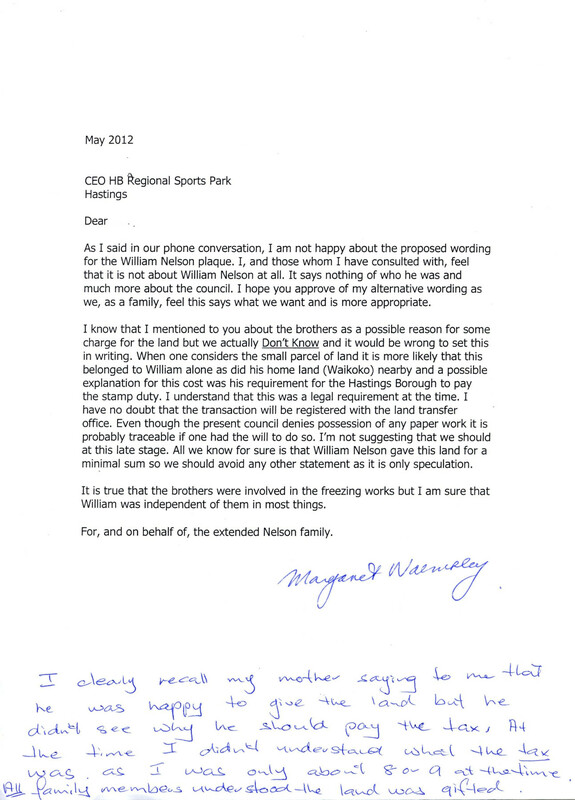 When one considers the small parcel of land it is more likely that this belonged to William alone as did his home land (Waikoko) nearby and a possible explanation for this cost was his requirement for the Hastings Borough to pay the stamp duty. I understand that this was a legal requirement at the time. I have no doubt that the transaction will be registered with the land transfer office. Even though the present council denies possession of any paper work it is probably traceable if one had the will to do so. I’m not suggesting that we should at this late stage. All we know for sure is that William Nelson gave this land for a minimal sum so we should avoid any other statement as it is only speculation. It is true that the brothers were involved in the freezing works but I am sure that William was independent of them in most things. For, and on behalf of, the extended Nelson family. I clearly recall my mother saying to me that he was happy to give the land but he didn’t see why he should pay the tax. At the time I didn’t understand what the tax was as I was only about 8 or 9 at the time. ALL family members understood the land was gifted.